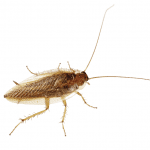 Suffolk County Cockroach Removal | EcoTech Pest Control Inc.
GERMAN COCKROACHES are NOTORIOUS home invaders, and are a constant threat and nuisance in the food industry. Although they have wings, they cannot fly. Instead, they rely on highly developed legs to scurry quickly from place to place. Adhesive pads on their feet allow them to walk on smooth flat surfaces, including sheet metal and glass, or to run across ceilings as easily as they run across the floor. Females need only mate ONCE in their lives, and then they will begin to develop egg sac after egg sac throughout the duration of their life. A female reaches sexual maturity within three weeks after birth, and can survive up to a year in stable conditions. She will develop and drop 1-2 egg sacs per month, with each egg sac (or ootheca) containing an AVERAGE of THIRTY roaches (an egg sac can carry as many as 50 roaches), and close to 80% of the babies, or NYMPHS, will be FEMALES whose sole purpose is to start laying more egg sacs. In Less than a years’ time, one egg sac dropped in your home or business can lead to the birthing of ONE HUNDRED THOUSAND ROACHES. The roaches are excellent survivors, and skilled at finding hiding places. They need only 1/8” gaps to hide in. That means the roaches will find places you would NEVER even think of to hide in. They scavenge mostly at night, avoiding light as much as possible, so often times they will be in your home for several weeks before ever being noticed. Once the roaches begin coming out in daylight or while the lights are on, it is likely that there is a large infestation lurking within the premises. The action of the roaches exposing themselves in the light is an indication of desperation due to competition for food sources. Many people believe that keeping a clean home or business they can prevent or eliminate roaches. But the fact is, roaches can and will survive in any conditions, and they will find adequate food sources ANYWHERE. All roaches are a threat to carry and spread disease. Furthermore, many people, especially children, can develop allergies to their droppings and shedding.